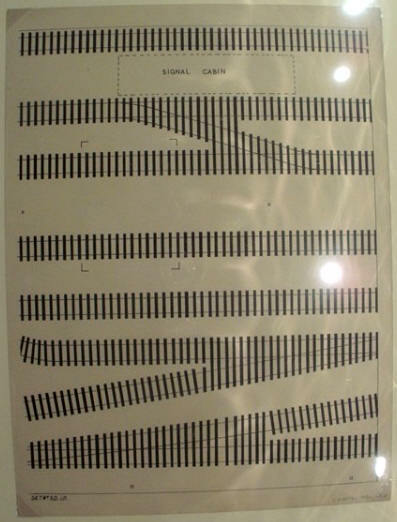 4 sheets: Track layout showing positioning of track and lineside features. 5 sheets: Scenic background and sides. 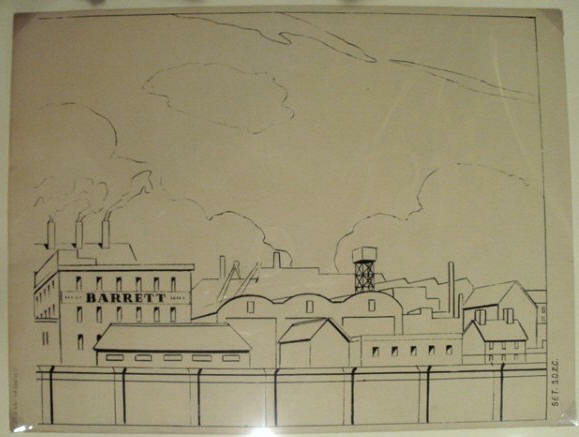 Low relief model factory with a loading bay, from thick card. The sheets are signed FAB. 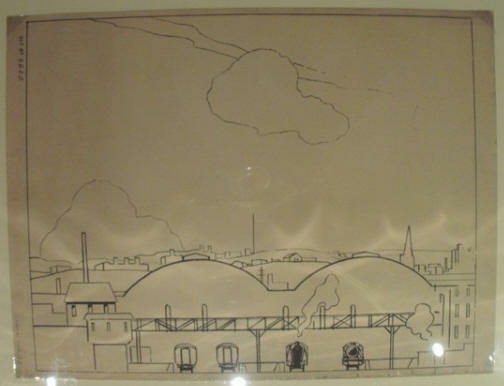 4 sheets: Locomotive shed and workshops. Reference is made on SD 4 C to loco sets M 1, M 2, HM 1 and HM 2. Sheets A and C are signed FAB. 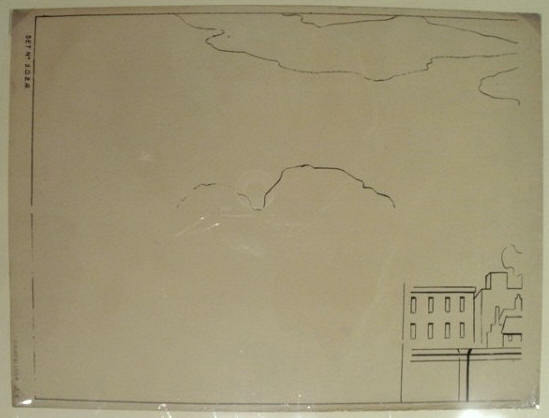 2 sheets: Turntable and water tower. Both sheets are signed FAB. 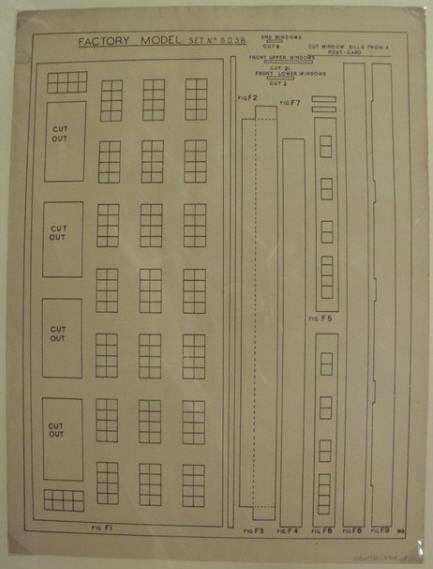 2 sheets: Signal cabin and preparation pits. 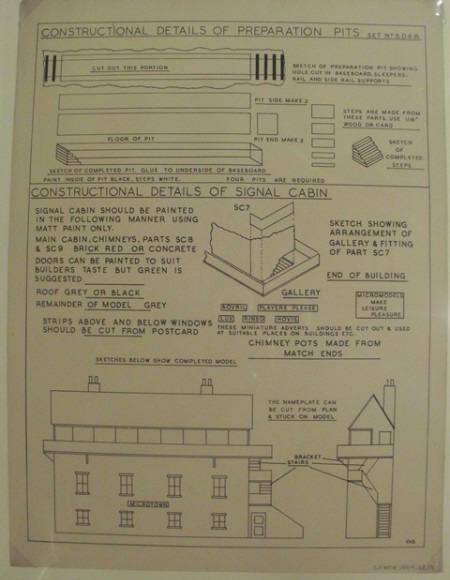 The signal cabin is of a large three storey design. Both sheets are signed FAB. 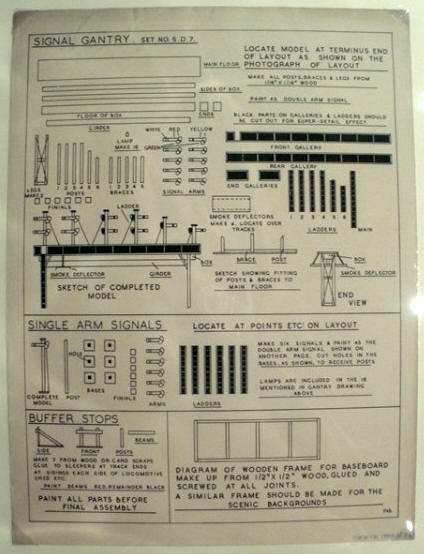 1 sheet: Signal gantry gantry, single arm signals and buffer stops. 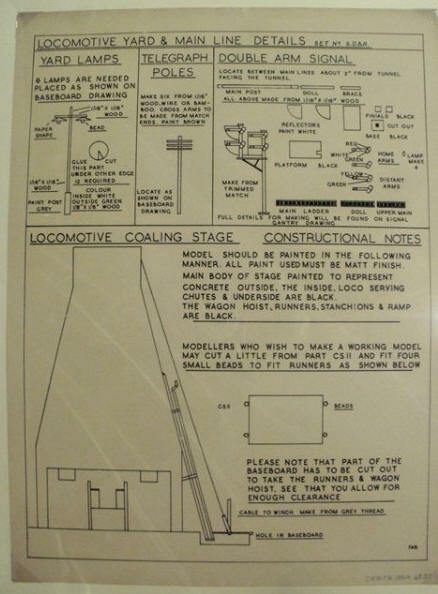 3 sheets: Locomotive coaling stage, yard lamps, telegraph poles and double arm signals. 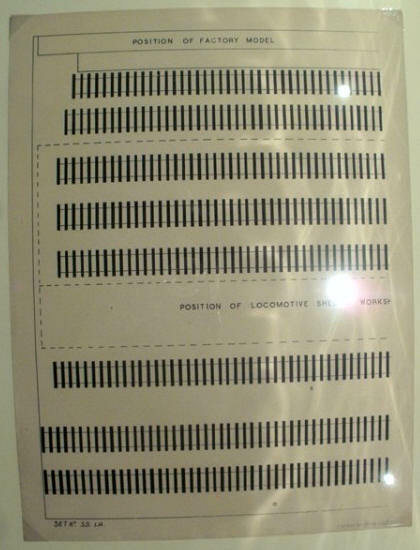 Description First and only printing of the SD 1-8 Scenic Display Plans of Goods Yard was in 1949 at 6d per sheet, or 10/- the set. Out of print by 1952. This is not a packet Micromodel. It is a collection of photostats. The sheets are of light straw coloured thickish paper. There is only one known surviving set of SD 1-8. Interesting facts about the sheets. 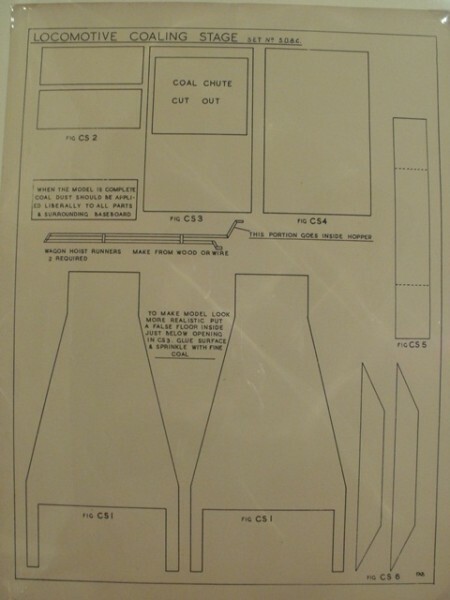 None of the sheets carry a Micromodel heading or logo of any sort. They are thus not immediately identifiable as Micromodel products. 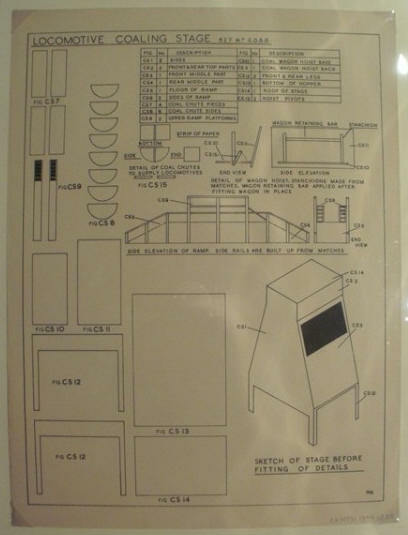 There is, however, the odd reference to Micromodels in the text on some of the sheets. 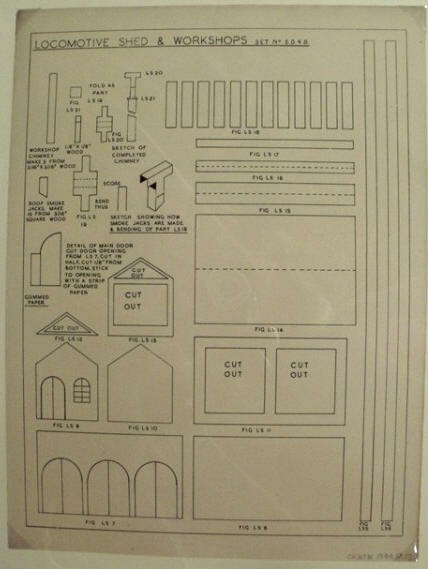 None of the sheets can be described as cut-out models. 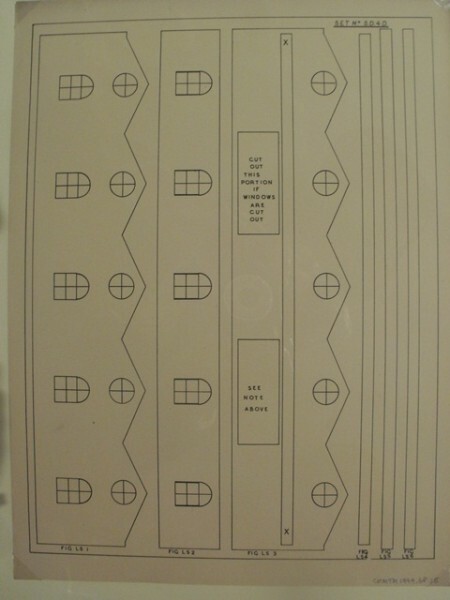 The intention appears to have been that you traced or marked out the major components of the design on thick card. 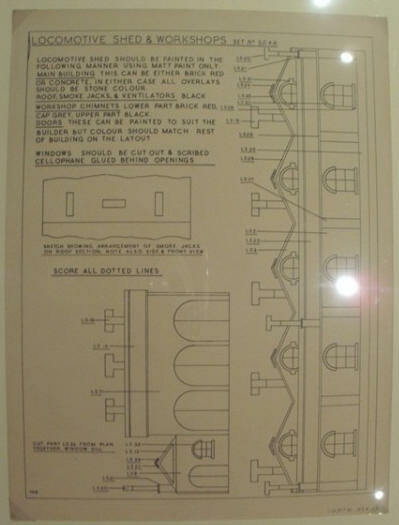 Many of the sheets carry painting instructions. 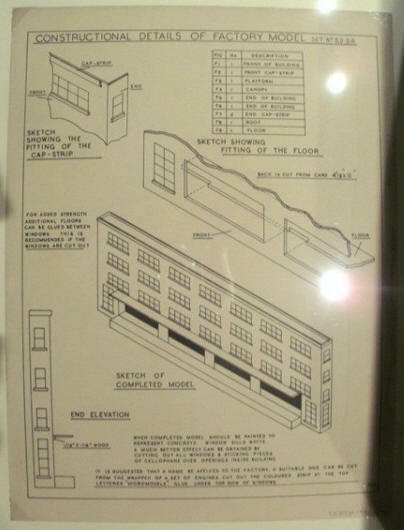 There would appear to be no necessity for separate instruction sheets as most of the sheets carry small notes offering details of assembly, materials and painting requirements. 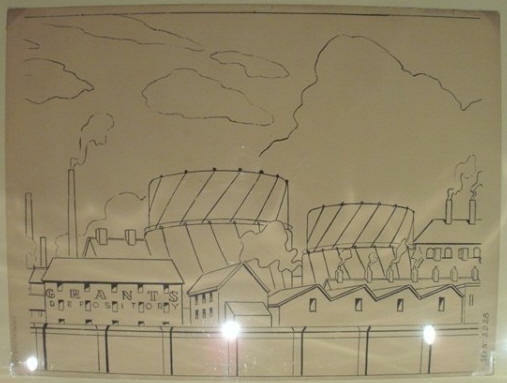 Two of the factory buildings on the scenic sheets carry the names Brown and Barratt. There are a few possibilities about who is FAB, who signed some of the sheets. 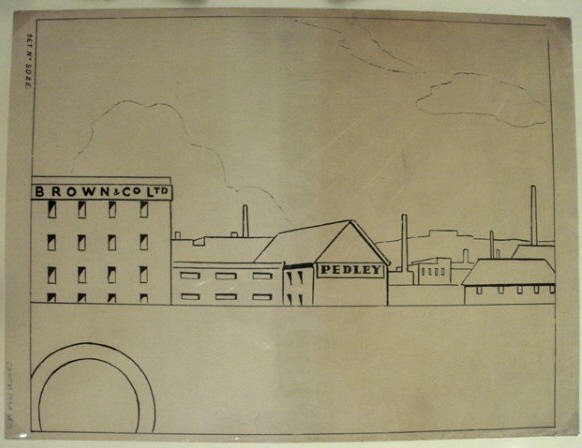 It could be Mr. Brown, Mr. Barratt or Mr F. C. Banks of Raleigh, Essex who is assumed to have designed the sets LS I, LS II and LS III. 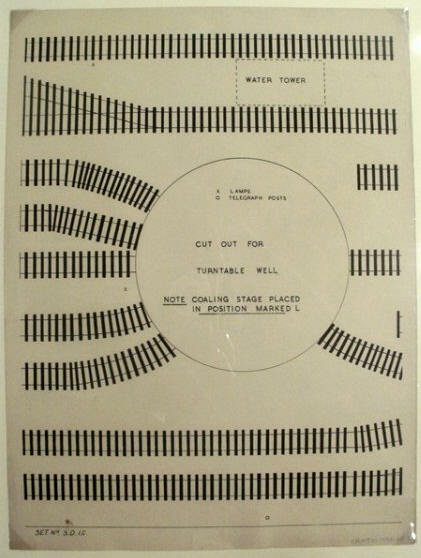 Layout of the Scenic Display of Goods Yard. 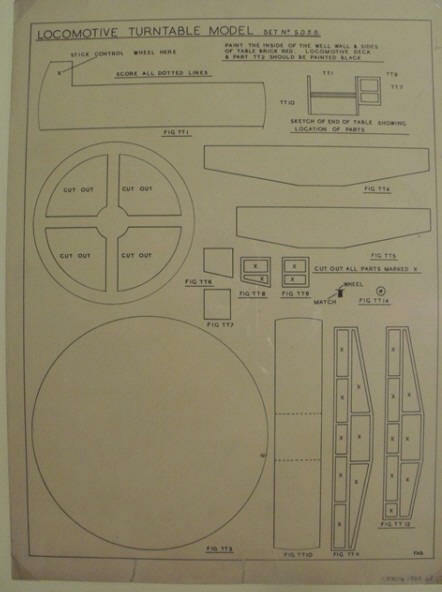 There is a picture of the entire SD 1-8 layout in the Micromodel book “Making Models in Card” on page 16 and 17. This is a reprint of the 1949-1950 catalogue picture. 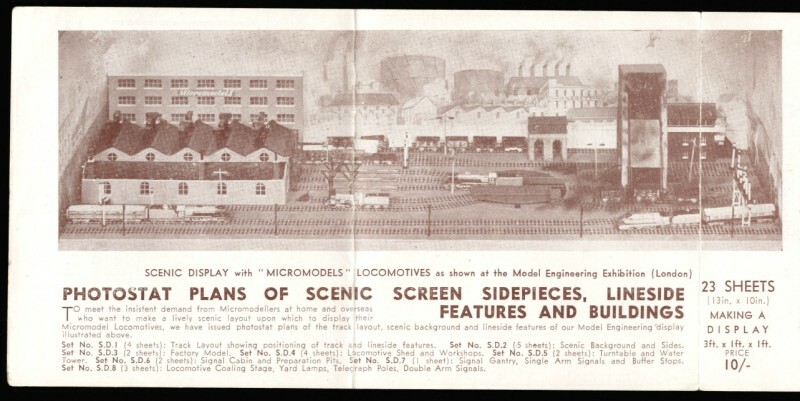 To meet the insistent demand from Micromodellers at home and overseas who want to make a lively scenic layout upon which to display their Micromodel Locomotives, we have issued photostat plans of the track layout, scenic background and lineside features of our model engineering display illustrated above. Set No. 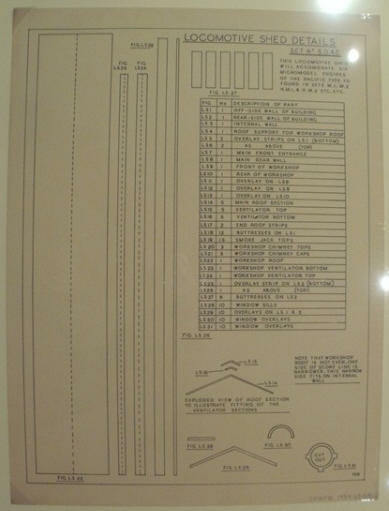 SD1 (4 sheets) track layout showing positioning of track and lineside features. Set No. SD2 (5 sheets) scenic background and sides. Set No. 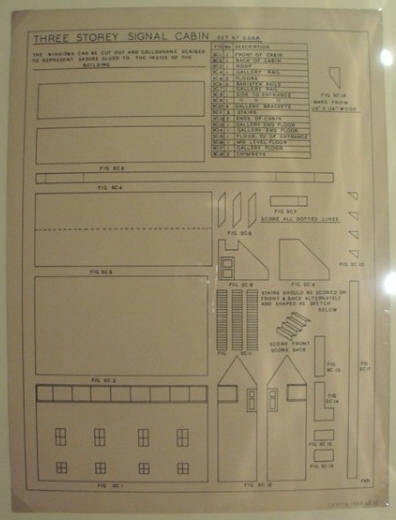 SD3 (2 sheets) factory model. Set No. SD4 (4 sheets) locomotive shed and workshops. Set No. SD5 (2 sheets) turntable and water tower. Set No. SD6 (2 sheets) signal cabin and preparation pits. Set No. SD7 (1 sheets) signal gantry, single arm signals and buffer stops. Set No. SD8 (3 sheets) locomotive coaling stage, yard lamps, telegraph poles and double arm signals. 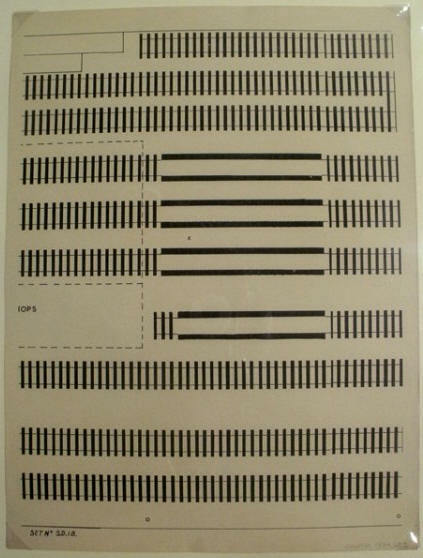 23 sheets (13ins x 10ins) making a display 3ft x 1 ft x 1 ft. Total price of the set 10/-d. 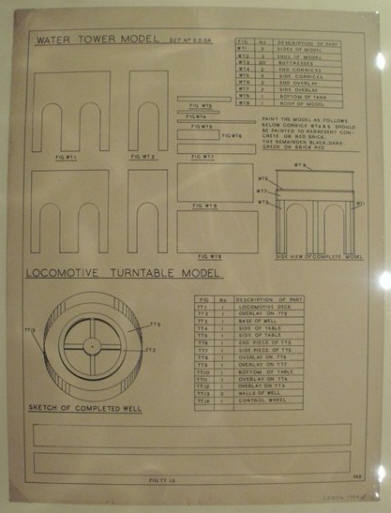 The model engineering display quoted in the catalogue text refers to the Model Engineering Society’s annual display held at the Seymore Hall in central London. Various retailers and manufacturers were allowed trade stands.